The National Weather Service trimmed back on the Winter Storm Warnings and Winter Weather Advisories. 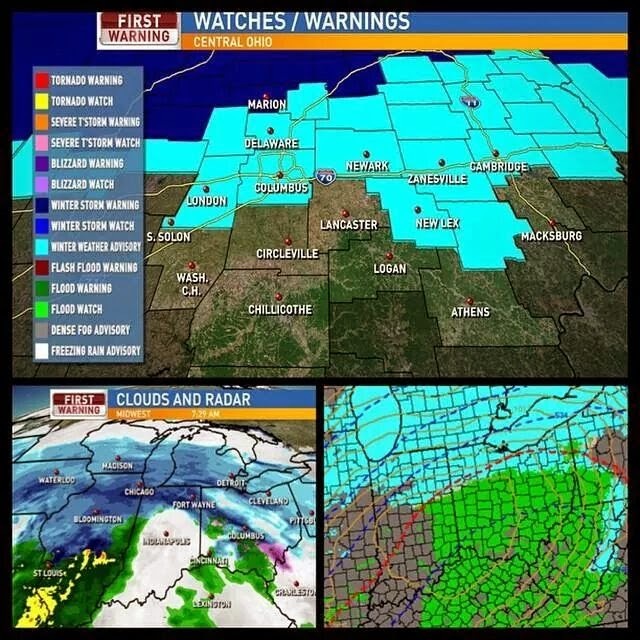 The leading edge of the system is/was a wintry mix for Central Ohio. Temperatures are right near/above freezing so a lot is melting as it falls and out temperatures will continue to warm through the day. We will see a dry spell for late morning and then rain for the afternoon/evening. The rain/snow line will push into far Northern Ohio this evening. We could see a quick snow shower overnight but the ground will be wet at first so that will have a hard time sticking until the wet surfaces freeze. We could see a dusting in spots, but nothing that should require a snow shovel for Central Ohio. You will need the salt though... Things will refreeze very fast tonight for an icy Monday morning. Have a good one!